From Silicon Valley on the West Coast to Wall Street in the East, 2018 was a year full of brands finding themselves in sticky situations, often of their own making, and trying to find a way to get back on the public’s good side. It seems like we see more and more brand apologies spurred by public outrage as the years go on – but whether you’re of the belief that brands are at the mercy of an angry public because “PC culture has gone too far” or think people are simply finding out about things they wouldn’t have before the age of the internet, you can’t deny that we’re driven by a morbid curiosity to see how companies fare with a widely publicized scandal. If I had to pick a sentence to summarize the mood of 2018, “Fast-fashion retailer called out for casual racism over children’s clothes” would be a front-runner. Quick recap: H&M published an image of a young black boy modeling a sweatshirt that read “coolest monkey in the jungle” while using only white models for a range of other sweatshirts featuring images of animals and phrases like “Mangrove jungle survival expert,” raising concerns over the racial stereotype comparing people of color to monkeys. After initial public outcry, the company was quick to tell The Telegraph that the image had been removed, apologizing to “anyone this may have offended.” While the quick response was a good start, it was not nearly thorough enough to quiet the anger mostly seen on Twitter, and the company followed up with a statement explaining the decision to remove the image along with the garment itself. At the end of the day the vocal public moved on from the issue, but not before doing real damage to the brand’s reputation. As they say, an ounce of preparation is worth a pound of cure. Better product screening could very well have saved H&M a social media headache. After months of Facebook troubles in the news, it would be understandable if you had a hard time remembering their biggest scandal of the year: the exposure of their sale of user data to Cambridge Analytica. When a whistleblower first approached The Guardian and The New York Times, the estimated count of affected users was reported at 50 million, but the story only got worse as time went on – that number ballooned to 87 million over March and April 2018 as inquiries exposed just how much data the analytics firm had been collecting (and how much it may have swayed the already-controversial 2016 presidential election). The story was damning, and the company’s response didn’t help: executives were slow to take accountability, staying quiet or vague until they were dragged into court, and the eventual apologies framed Facebook as another victim of the scandal rather than the marketplace where our personal data was sold. Facebook stock took a nosedive, and while it appeared to recover for a time and even reached record highs, the new year saw it at its lowest point in two years. The moral of the story? Maybe don’t sell your users’ personal data, but if you must, make sure they know! And when they inevitably find out, don’t treat them like children; founder and CEO Mark Zuckerberg’s classic “I’m much smarter than you” attitude played particularly poorly this year (although, admittedly, forcing Congress to try to understand the internet brought us some very funny content). The campaign, while certainly creative, left a lot to be desired by those who understood the situation. Fast Company summed up the perceived tone succinctly: “This was just a blip, trust our cowboy past, not the multiple fraud scandals.” It can be difficult for such a large brand to discuss its own shortcomings so openly, but this was not a situation that called for metaphor; customers needed to be assured that the company was taking the issue seriously, and not just the repercussions. 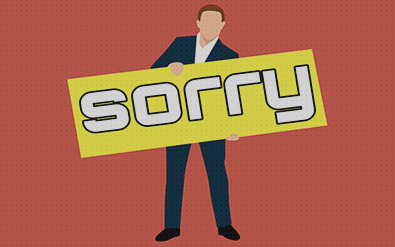 Brands have been apologizing since long before the internet, and will probably be apologizing long after its gone, but 2018 saw more stumbles than ever before. As PR professionals, it’s up to us to see the lessons in these public shamings: be quick to own your mistakes, honest about your shortcomings, and earnest in your desire to make things right. If the public doesn’t think you’ve learned your lesson, you’ll find them to be a much less forgiving teacher in 2019.